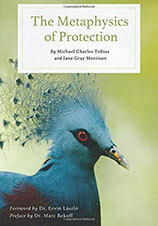 Waterfront Press, Michael Charles Tobias and Jane Gray Morrison announce the digital and print releases of Tobias and Morrison’s book, The Metaphysics of Protection. The Metaphysics of Protection proposes a first-time discourse that bridges the discussion between biological conservation, animal liberation, and a new hope for interspecies coexistence, protection and support. The Metaphysics brings the idea of interspecies “protection” to a new level. In a world where human beings kill hundreds of billions of animals every year, for reasons that are as meaningless and trivial as sport and convenience, and while 800 million human beings are chronically malnourished, The Metaphysics of Protection dares readers to enter into a new conversation where humans can find and build new connections with their fellow species and the planet as a whole. Tobias and Morrison create a refreshing convergence between interdisciplinary ecological science and inner-species relations. The Metaphysics of Protection challenges the status quo between and within the relations of human and other species, offering a new level of possibility in the they way we coexist with our fellow creatures. Michael Charles Tobias and Jane Gray Morrison have woven together an interdisciplinary yet cohesive work of nonfiction prose that takes the reader to an entirely new territory of thinking, with groundbreaking implications for art history, natural science, philosophy and spirituality. Michael Charles Tobias and Jane Gray Morrison are authors, ecologists, filmmakers, historians and non-violence activists. They run the Dancing Star Foundation (www.dancingstarfoundation.org), a U.S. non-profit dedicated to global biodiversity conservation, animal protection and environmental education. Waterfront Press was founded by William Gladstone of Waterside Productions (www.Waterside.com) to fill a growing need for authors to release their work directly to the general public through a digital platform. Waterfront has established a special relationship with Amazon to offer a full service, turnkey solution for digital publishing.